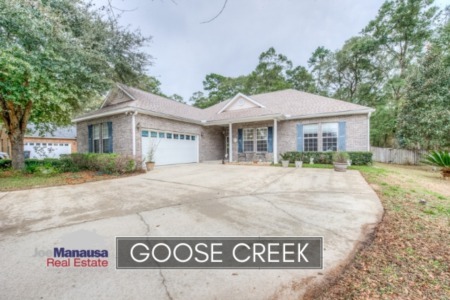 Goose Creek is one of many neighborhoods that sprung-up in the past 20 years on the east side of the Tallahassee real estate market. It features 3 and 4 bedroom homes in a zip code (32317) that is growing in popularity. There are 169 homes built from 2002 through 2007 in Goose Creek, so you can expect this neighborhood to be a candidate for pent-up supply due to the combination of a slowed market intersecting normal family move-cycles. Roughly 150 families moved into Goose Creek in a 3 year period of time, thus we anticipate that now is the "normal" time to move for most of them. In this report, we will look at average home prices, average home values, and average home sizes in Goose Creek, as well as show current listings in the Tallahassee MLS and all closed home sales going back to 2003. Average home prices dipped slightly in 2014 versus 2013, but have shot up 13% thus far in 2015. The average recorded sales price is $241,300 for Goose Creek thus far in 2015, which is only 13% lower than home prices at the peak of the market in 2006. Home sales activity this year appears to be consistent with what we have seen over the past nine years, but still well below the levels recorded during the most active years from 2002 through 2006. 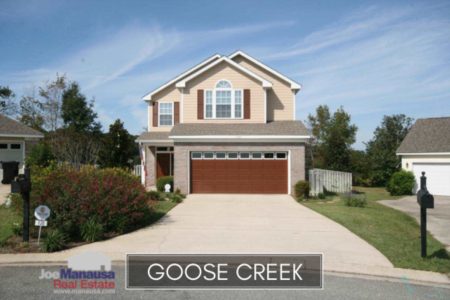 Thus far in 2015, there have been 3 closed home sales in Goose Creek. Average home values in Goose Creek rose nearly 7% in 2014, and are up an additional 8% in 2015, the third year in a row to report rising home values since the low set back in 2012. Through the first week in April, the average value of a home sold in Goose Creek has been $123 per square foot. This is up 23% over the bottom reached in 2012, but still down about 16% from the market high set back in 2006. This means that many homeowners who have purchased or refinanced in the past 10 years are likely at zero or negative equity situations. The average home size sold in Goose Creek typically falls in a range of 1,600 to 2,000 square feet, and this year buyers have been selecting the larger homes. The 3 sales thus far in 2015 have averaged 1,960 square feet. The following list of homes are the most recent listings in Goose Creek. A red box will appear when no homes are listed for sale in the Tallahassee MLS, but check back again on a regular basis as this page updates twice daily. The following list shows home sales going back to 2002, the first year of home sales in Goose Creek. I hope you enjoyed our April 2015 update on home sales in Goose Creek, please feel free to drop me a note if you have questions not covered in this report.